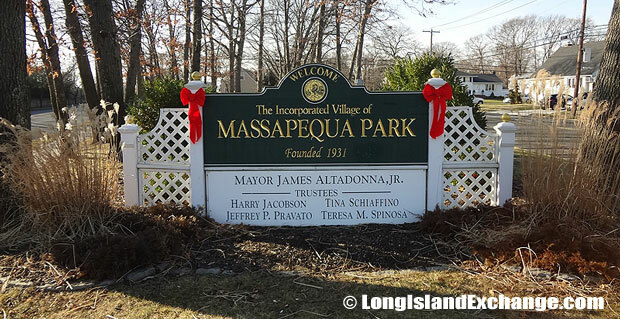 Massapequa Park is an incorporated village located in Nassau County, on the South Shore of Long Island, New York. It is in the south part of the Town of Oyster Bay. Massapequa Park is on Great South Bay and Bar Harbor. As of the 2010 census, there were 17,008 people, 5,617 households, and 4,698 families residing in the area. The median income for a household in the village was $103,568 and the median income for a family was $116,556. Males had a median income of $81,146 and just $54,854 for females. The latitude of Massapequa Park is 40.680N. The longitude is -73.455W. It is in the Eastern Standard time zone. Elevation is 23 feet. 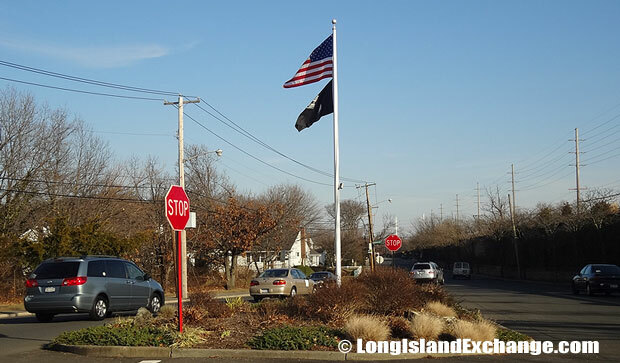 A sign welcomes visitors and residents to Massapequa Park. 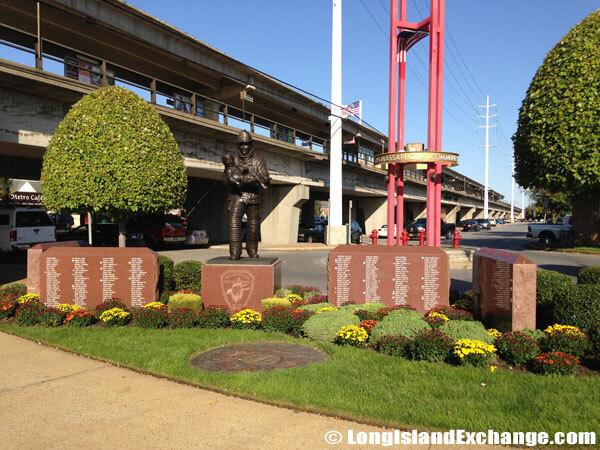 A memorial to firefighters outside Massapequa Park Train Station along Sunrise Highway. 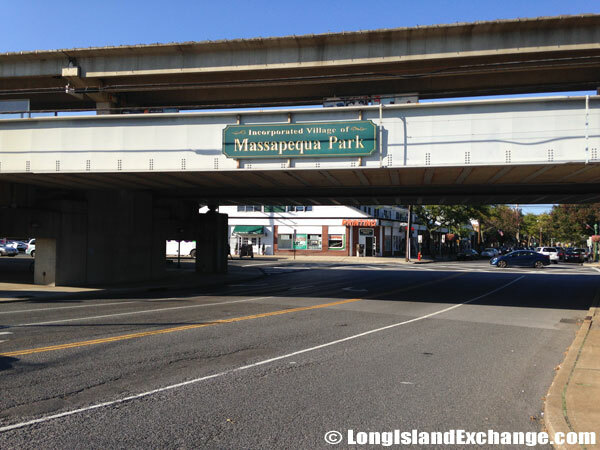 A sign along the Train Overpass welcomes visitors and residents to the Incorporated Village of Massapequa Park. 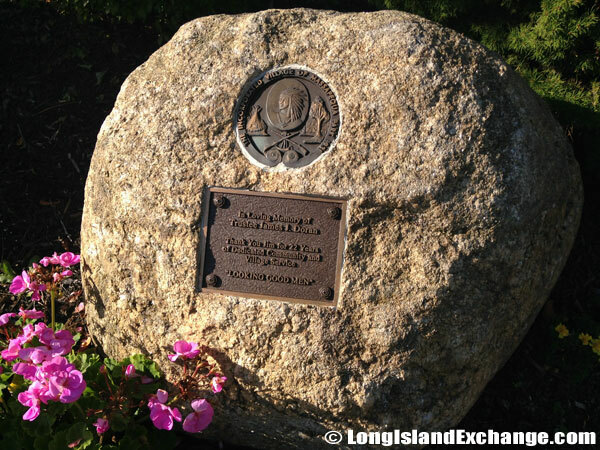 The community was named after an Indian tribe and shares the early history of Massapequa. During 19th century, the families of German descent relocated from Brooklyn to what is now Massapequa Park, and the resulting community was known as Wurtenberg or Stadtwurtemburg. 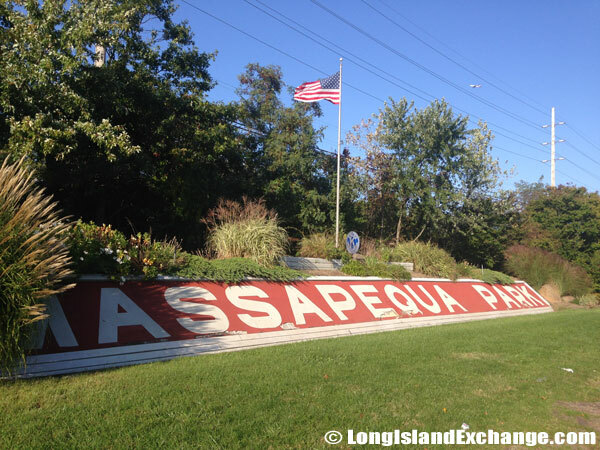 Massapequa Park became an incorporated village in 1931 to ensure control of land use and other issues. The Long Island Rail Road fuelled Massapequa Park’s growth in the 19th and early 20th centuries, much along the lines of all Long Island. The three Irish-Americans namely Michael J. Brady, Frank Cryan, and Peter Colleran described their project as having a bit of Old Erin and the area still has its mostly Irish street names. A side street Massapequa Park on the north side of the Train. 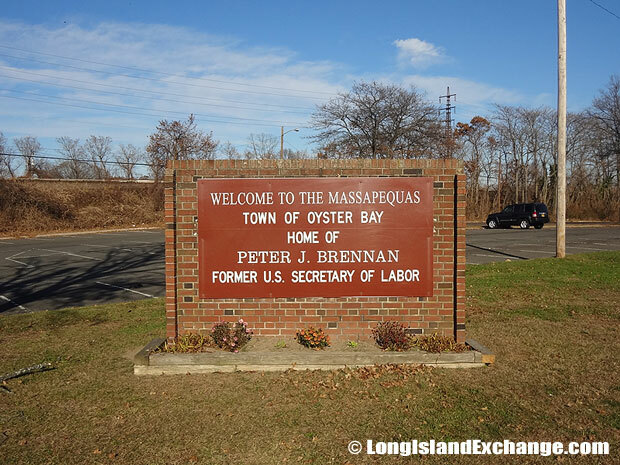 A sign at the corner of Broadway north of Sunrise Highway welcomes visitors and residents to the Incorporated Village of Massapequa Park, founded in 1931. A memorial stone dedicated to the loving memory of Trustee James Doran. Famous residents living in Massapequa Park include Neil Duffy (Norfolk Academy physics teacher), Candy Darling (Warhol superstar), Stanley Newman (publisher), and Phil Baroni (Martial arts fighter). The Baldwin Brothers, musician Dee Snider, and comedian Jerry Seinfeld also all grew up in the area. The racial-makeup of Massapequa Park comprises of 97.37% White, 0.22% African American, 0.02% Native American, 1.41% Asian, 0.02% Pacific Islander, 0.39% from other races, and 0.57% from two or more races. Most of its resident’s ancestries were Italian, Irish, German, English, and Polish. 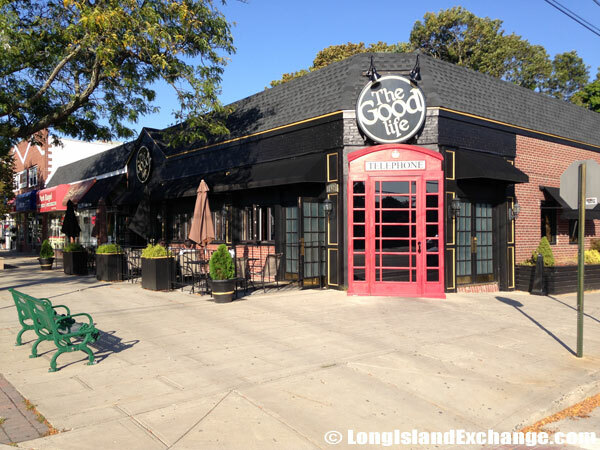 The Good Life, An English Style Pub Restaurant in Massapequa Park. Nassau BOCES on Carmans Road provides services for 56 school districts in Nassau County. 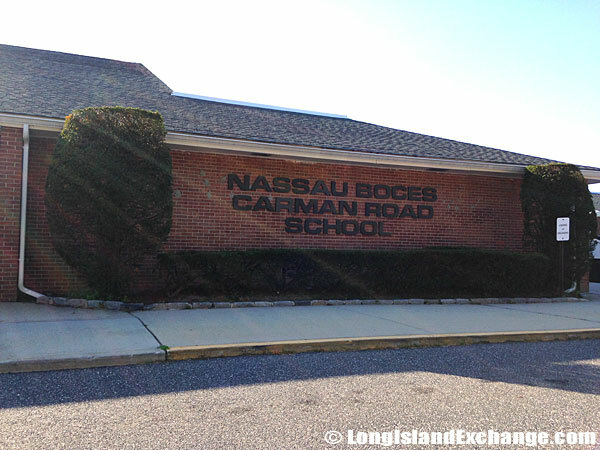 The Massapequa School District had undergone several developments in 1990s by leasing Carmans Road Elementary to Nassau BOCES and Hawthorne Elementary to the Nassau County Police Academy. John P. Mckenna Jr. High School was converted to an elementary school, while Alfred G. Berner became the new middle school. J. Lewis Ames Jr. High School is also no longer a middle school, but now the “Ames Campus” of Massapequa High School, which is where the 9th grade currently attends. More than 90% of the residents have completed High School education. 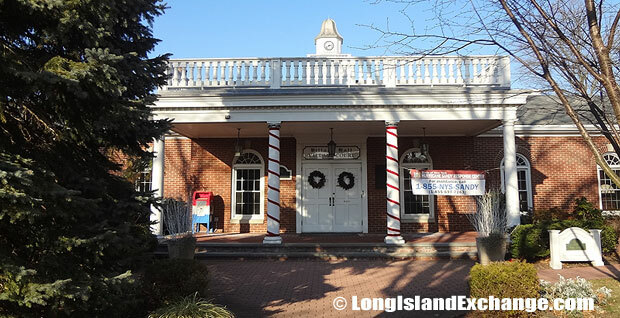 Massapequa Park Village Hall and Courthouse. A typical holiday scene down Broadway in Massapequa Park, heading north. 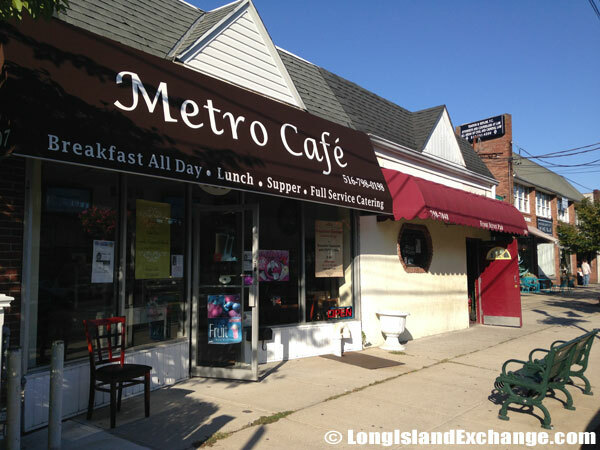 Massapequa Park offers the best international cuisine, elegant cafes, and shopping centers which make it a great place to live. The hamlet has also a picturesque business district along Park Boulevard, lined with local merchants’ shops. Other commercial areas can be found along Sunrise Highway and Merrick Road. 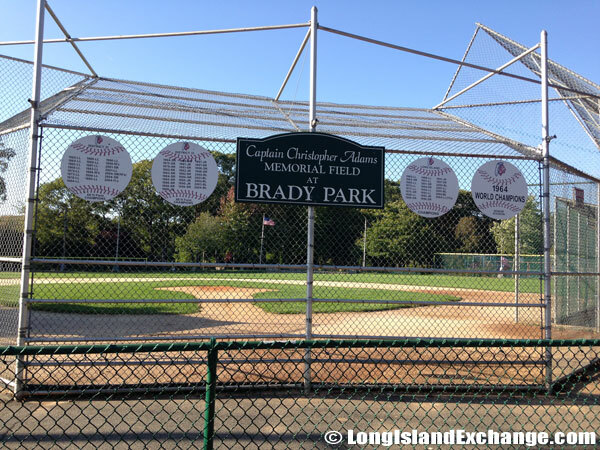 There are three village parks in town such as Colleran Park on the water, Mansfield Park in the northern section with athletic fields and Brady Park at Lake Shore Drive and Front Street, with athletic fields, tennis courts, a playground and picnic areas overlooking the adjoining Massapequa State Park Preserve. 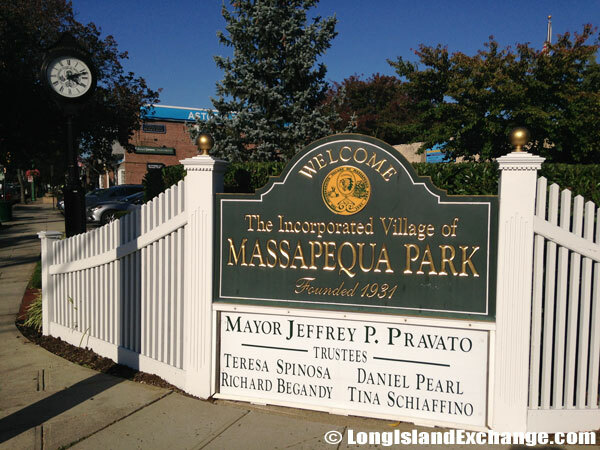 A sign welcomes visitors and residents to the The Massapequas, the areas of Massapequa Park and other neighboring towns such as Massapequa, North Massapequa, and East Massapequa. Massapequa Park decorative stone blocks along Sunrise Highway’s north side.